Enter into a sanctuary of reflective and inspirational music with this collection of fresh piano arrangements of beloved hymns. Optional instrumental obbligatos are included to enhance each setting. Whether you are playing for a sacred gathering or simply your own times of reflection, "Sanctuary" is a cathedral of beautiful music for your journey of faith. A sanctuary of worship can be anywhere... a beautiful indoor auditorium, a favorite room at home or a lush green forest. 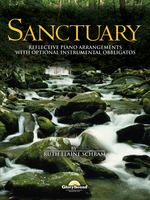 The fresh, playable keyboard arrangements in this collection were created to capture that part of worship which is comforting, nurturing and reflective. Use them in group worship and/or for your personal enjoyment and worship. The instrumental parts include C-Instrument (treble clef), B-flat Instrument, French Horn and C-Instrument (bass clef). These parts are designed to be easily played by adults or young people who play in school or community groups or have taken private lessons. Ranges are moderate; key signatures appropriate for the instrument. To make this book as flexible as possible, several of the songs offer the instrumental part in different keys for more than one type of instrument. I hope that you will enjoy using and playing these arrangements as much as I have enjoyed writing them, and that your music ministry will be enriched by sharing the many talents God has bestowed on your church. May God bless you as you continue to serve Him!